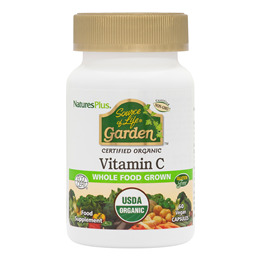 Nature`s Plus Source of Life Garden Vitamin C provides 500mg of vitamin C and 100mg bioflavonoids from certified organic amlaberry, supplying 2500 ORAC units of antioxidant activity. With over 20 organic whole foods. Organic Gold Standard Amla Berry - Citrus fruits and acerola cherry, supplying 500mg vitamin C in every serving. 2500 ORAC - Guaranteed antioxidant activity per serving. Whole Food Bioflavonoids - 100mg from organic amla berry. Organic Whole Foods - More than 20 colourful fruits, vegetables, mushrooms and more for optimal antioxidant and phytonutrient support. Natural Whole Food Enzymes - For maximum support. Vitamin C (naturally occurring from Organic Gold Standard Amla [Emblica officinalis] and Citrus Fruits [Citrus, limon, aurantium] and Acerola Cherry Fruit [Malpighia glabra]), Organic Gold Standard Amla, (certified organic amla fruit), Organic Whole Food Bioflavonoids - (Quercetins, Rutin, Leucodelphinidin) from Organic Gold Standard Amla Berry. Other Ingredients: Certified Organic Gold Standard Whole Food Blend [Organic Acerola Extract, Apple Fruit, Broccoli Sprout, Cauliflower Sprout, Collard, Cordyceps Mushroom Mycelia (Cordyceps sinensis), Kale, Kale Sprout, Maitake Mushroom Mycelia (Grifola frondosa), Nettle, Parsley, Pure Beet Juice, Pure Carrot Juice, Pure Spirulina, Reishi Mushroom Mycelia, Shiitake Mushroom Mycelia (Lentinula edodes), Spinach, Tomato Juice, Wild Bilberry, Wild Blueberry, Wild Lingonberry, Pure Chlorella], Organic Rice Maltodextrin, Mineral Fatty Acid Esters (Ca, Mg) from Safflower. As a dietary supplement, two vegicaps daily. Below are reviews of Source of Life Garden Vitamin C - 60 Vegicaps by bodykind customers. If you have tried this product we'd love to hear what you think so please leave a review. Pricey but well worth it if you are feeling run down after illness or need a boost. 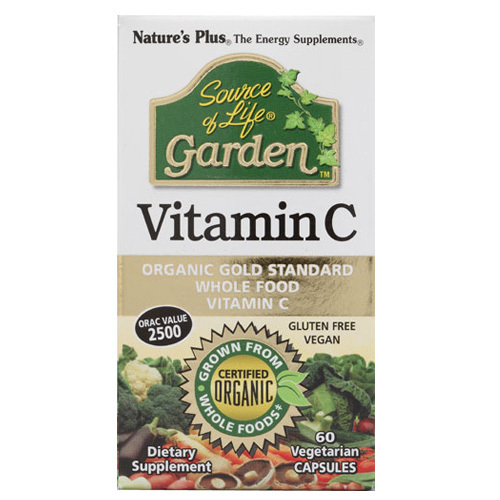 Natures Plus Source of Life Garden Vitamin C provides 500mg of vitamin C and 100mg bioflavonoids from certified organic amlaberry, supplying 2500 ORAC units of antioxidant activity! With over 20 organic whole foods.